Contents: Spinach soup and pasta with cheese and ham. Current average wage in the Czech Republic is about $1100 per month"
So is that $1 a day for the food? In a month it'd be about 20 - 22 weekdays, or $22/month? That means if they are 15 or older, at $1.50 x 22 days = $33/month per kid which is 3% of their wages? well, it's about 2 % of an average Czech wage... But as you surely know, average wage is quite vaque information, most of the people don't earn this money... So let's say, people usually earn about xy minus taxes and other payments (insurance and so on) then their money is about $630 per month. That means payment for their kid's lunches at school for one month makes approximately 3,75 % of their wage. I am leading a cultural exchange program of school food service directors to Eastern Europe in early April 2013. 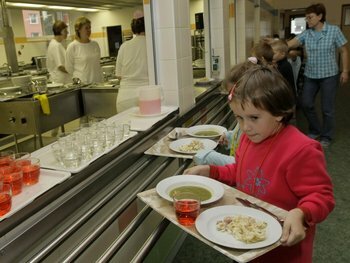 If you have a contact in the Czech Republic that can give us a lecture about the Czech school lunch program and a school tour and tasting, I would greatly appreciate it. and in the CR is normal that both parents work... so then the cost of lunches for one month would be half of that 3,75 % = about 1,875 % of income of one family. And there is one important point missing, the parents payment is only for value of the ingredients, work, electricity, hire of the building is paid from local school bureau. And it is not much. It is very small ammount of money, actually. So, imagine, you have to build whole meal for so little money as ONE dollar or something like that.